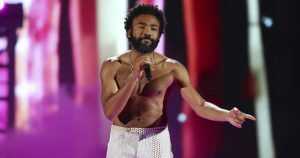 Childish Gambino premiered a brand new track during his headlining performance on night 1 of the 2019 Coachella Valley Music and Arts Festival this weekend. The new track starts off with a tribal feel. It even begins with Childish speaking in a another language, possibly an African dialect. He also calls on the crowd to join him with his tribal chants. Check out the new track below.